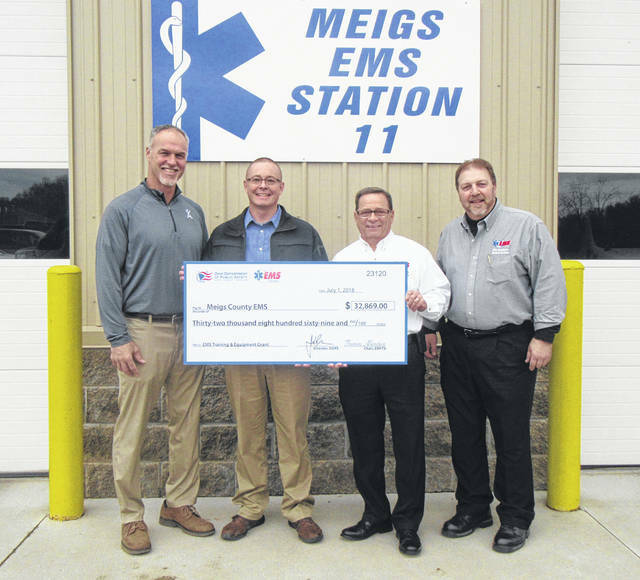 Commissioner Mike Bartrum, left, is pictured last fall accepting a grant along with Meigs EMS Director Robbie Jacks. Also pictured are Ohio EMS Director Mel House and Ohio EMS Deputy Director Rob Wagoner. POMEROY — The Meigs County Commissioners accepted the verbal resignation of Commissioner Mike Bartrum on Thursday during their regular meeting. Bartrum, who was not present for the meeting, is expected to be in attendance for his last meeting next Thursday, Feb. 14. The resignation comes as Bartrum has accepted a job with the Philadelphia Eagles, where he played the majority of his NFL career. Bartrum will also be stepping down as coach of the Meigs High School football team. Bartrum spent his collegiate career playing football for the Marshall University Thundering Herd and then played for several NFL teams, eventually going to the Super Bowl twice, once with the New England Patriots and then with the Eagles. He was also known for heading up the Bartrum and Brown Football Camp for area youth at MU, alongside friend, and MU alumni, Troy Brown. Bartrum, who is an independent, has served as Meigs County Commissioner since January 2009 and had nearly two years remaining on his third term. In accordance with the Ohio Revised Code, a person must be appointed to fill the vacancy on the Board of Commissioners. As an independent, the appointment process is different than what it would be for either a Republican or a Democrat resignation in which case the central committee for that party could make the appointment. In this case, the appointment comes from the two remaining commissioners, Randy Smith and Tim Ihle, and Meigs County Prosecutor James K. Stanley. Smith stated that the commissioners are accepting letters of interest for the vacancy until 3 p.m. on Wednesday, Feb. 13. All letters must be delivered to the Meigs County Commissioner Office on the third floor of the Meigs County Courthouse. https://www.mydailyregister.com/wp-content/uploads/sites/24/2019/02/web1_12.7-EMS_ne2018127941053-1-_ne2019271258563.jpgCommissioner Mike Bartrum, left, is pictured last fall accepting a grant along with Meigs EMS Director Robbie Jacks. Also pictured are Ohio EMS Director Mel House and Ohio EMS Deputy Director Rob Wagoner.